Best Flat Pedal for Someone with Big Feet? Discussion in 'Downhill & Freeride' started by whiteman, Jun 1, 2012. I've had a search, but couldn't find anything recent. Alright, so I'm after a new set of pedals. I'm coming off a pair of MG-1's which I found to be wayyyyy too small for my size 13 feet. - Easy to rebuild, so they'll hopefully last me a while. What are your opinions of a pedal that fits into this category? Not too fussed on price at the moment. Point 1 Podiums have a large platform, are fairly light and durable. They're by far my favorite flat pedals, but I've yet to try Canfields or Spikes. I considered putting my MG-1's on my daughter's bike, because the platform is just a bit bigger than the little (and heavy) pedals her micro mini bmx came with. The Atomlab Pimp pedals are huge. I love them The spindles did seem to bend rather fast but they are still working just fine. 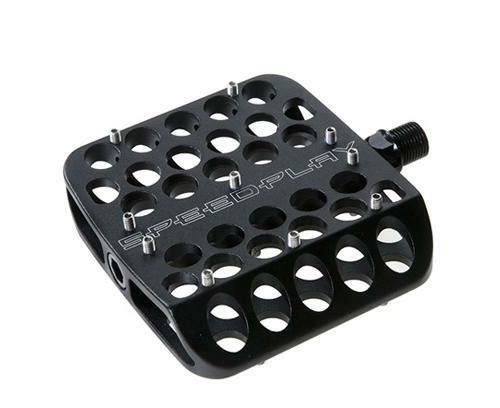 I like the Answer pedals, worked good all last year for me, I have a "toe out" on my right foot due to an injury so my foot doesnt set straight on the pedal rarely. Held up fine at the local gnar and whistler last year. 2. Straitlines are the biggest I've found. I have Straitlines. They're big enough for me (size 9), but there's definitely bigger pedals out there. ...They make another model. When the op was asking about big pedals, and a company makes 2 sizes, clearly I would be referring to the larger variant. I'm size 13, the straitlines feels great. I haven't seen any that feel bigger, but I do notice they straitlines feel noticeably bigger than anything else I've tried. The Predators did look very promising. They seems to be the biggest I could find. Where do you think is the cheapest place to get a pair from? Twenty6 are good pedals but make sure you buy steel pins. Alu ones last very short. 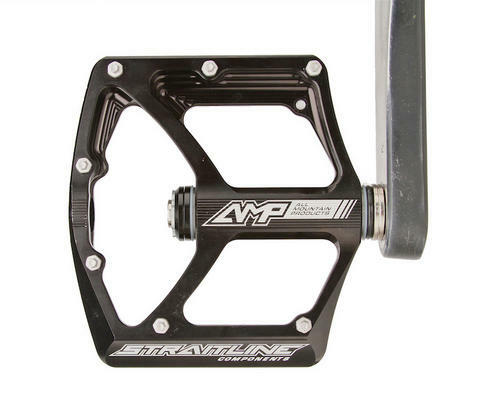 I have a size 12 or 13 in 5-10's and I was using Burgtec pedals and they seemed really good but I snapped an axle and am a bit scared to run them again. The Acros A-Flat supposedly has a massive platform. I would suggest a slight chamfer or cutaway on the outer leading edge of the pedal, my Burgtecs would hit something and bite in hard whereas other pedals I have used seem to glace off rocks. The new(ish) DMR pedal looks like an awesome bit of gear but I don't know if they are big enough. Only problem is I live in Aus and everywhere I found them online charges like $60-$70 postage. Where do you think is the cheapest place to get a pair from? Hahaha, you are from Australia, random pedal threads are part of the reason I'm not allowed to play on Rotorburn. Ask this question there, some numpty will tell you glow in the dark plastic pedals are the ****! Unfortunately, TBSM doesn't sell twenty6 stuff. No but having just had a quick surf of the price of them in Oz TBSM might be a good alternative for you if you want to look for other stuff. Rouler import 26 and Noskidmarks on here is the Oz distributor for Po1nt gear,hit him up, he also has has the Kowa flats in stock, they look pretty tidy too, Japanese made goodness. 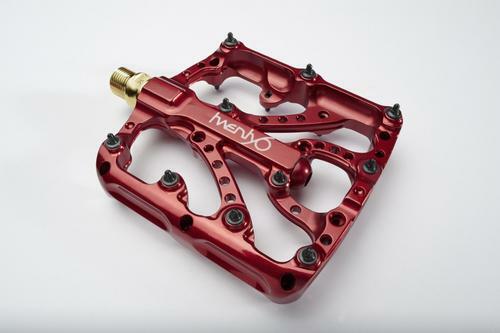 Check out the new e.13 pedals, they have a nice big platform and good concave shape. I love mine. Spank Spikes are nice, I like mine a lot but I have micro feet. General comment: Bushings... Never again. The Po1nt Podiums are now on my list. I just need to control the impulse. Well, I was assuming the Amps were replacing the older design... They're keeping the chunkier one? I wear a size 12 1/2 skate shoe while riding flats and I recently bought the Kona Wah Wah pedals. Happy with them so far and wont break the bank on price either. ***EDIT*** IF you decide to go with the Wah Wahs then don't try to order them from Cambria Bikes (they've been on back order for weeks). I had to cancel my order through Cambria and then order them from WheelWorld. Had them at my door in under a week. I have yet to see predators next to prerunners to compare size, but my Point 1's are noticeably larger than the prerunners. Okay guys, point1's aren't big. Even if they did have an average platform size. That knob on the inside of the pedal likes to push your foot out. I run the original straitlines and the platform is decently sized but like one of the guys said above "bushings, never again!". It was promising until i realized a bushing replacement kit costs half the price of a brand new pedal, and the same price as a cheaper pedals. I'm doing the same search you are right now. I wear a size 14 5.10 Impact. Been using Tioga MX-Pro pedals for years but am looking for something different now. Thought the Point1 Podiums would be good for me. Tried a set on a friends bike yesterday and the felt narrow due to the lack of spindle being right up against the crank arm. Glad I didn't buy them. Going to put my foot on a pair of Twenty6 Prerunners next week and see how those feel. 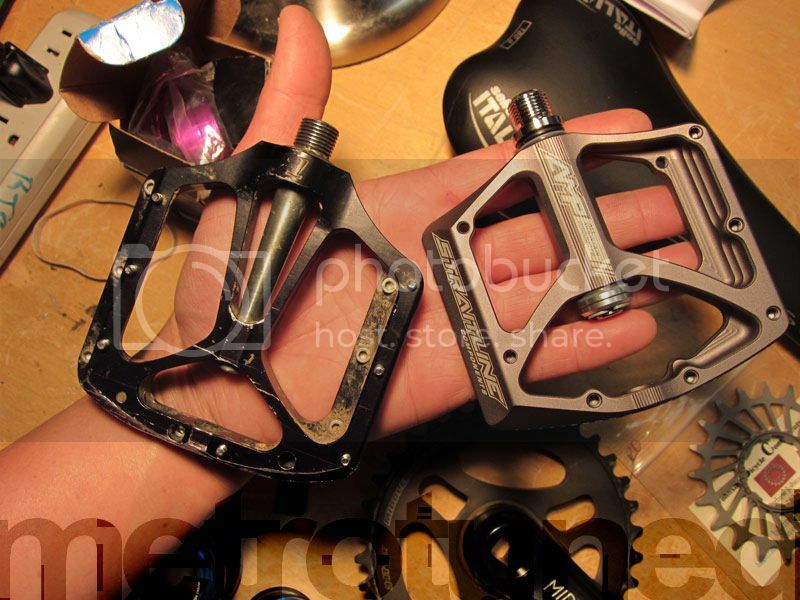 E.13 pedal looks interesting also. Funny, Ive never had a problem with my Straitlines, and they sent me 2 sets of rebuild parts for bothering to call, so that 5 years later, they run and work better than anything else. Way better than my 1 yr old Po1nt Podium. Take another look at the Podiums - the bulge is well outside of the platform area (which is just shy of 4" x 4"). That's what I liked about them over the Prerunners - I make use of the entire platform. As a comparison, MG-1's and Atomlab Trailkings are 3.5 x 3.75, Spec Lo Pro Mags are 3.75 x 3.75. And on Prerunners, which also have no exposed spindle, by the time I move my foot outboard far enough to miss the chainstay with my heel, about .5" of pedal platform goes untouched. the e.13 pedals are the ****. grippiest by far, and awesome platform shoe for the clown feet guys.